DON'T worry, this isn't a post about a bar with no alcohol... God, what kind of a terrible bar would that be?! "We only serve soda, soda water, and cran.." "Um, Good bye!" I mean, do you really think I would post about such a bar?!? Ha, no. On the contrary, this is a post about a really awesome bar. A bar where they serve free champagne and you walk away looking better than when you came (when does that happen?!). Do I have your interest piqued yet??? ... I knew it! So now is when I tell any men reading this, the caveat: Sorry dudes, this is a bar for ladies only.. It's also a bar where they show chick flicks on every TV screen and have trashy mags lining the bar top. ...Not so sad now, are you gentlemen? Well don't worry, you don't "qualify" for their service anyway! Drybar is a place where you can go and get your hair blown out.. And come out looking like a million freaking bucks! Which, as the holiday season gets well underway, there are ample opportunities for this service to become your best investment of the year! Drybar was the first blow dry bar I went to and I left so impressed with how my hair turned out (AKA: Waaay better than I have ever been able to do it myself), that I became an instant convert to the benefits of blow dry bars. But Drybar is a notch above the rest though, in my opinion. The hair style quality they put out is consistently stellar and they make the whole experience super fun to boot. Once you arrive, they get you a gratis glass of champs, a mimosa, juice or glass of white wine (uh yep, I love it there). Then they have you choose from this mini book of hair styles that have fun "bar-related" names like the "Cosmo-tini," the "Mai Tai," or "Southern Comfort." After you've selected the style you like best they take you to this cute room where they wash your hair and massage your scalp and then bring you back out to the bar where you can have a seat, read gossip mags and watch the chick flick they have playing on the TV screen in front of you (with subtitles of course... it is a blow dry bar!). The best part though, is at the end, when they spin your chair around and your hair looks just like the model in the photo you selected your hair style from. To me, that is outrageous. I can't tell you how many times I went to a hair stylist before a dance in high school and had to rush home before my date came to come get me because I had too much pomade in my hair or the curls (Ok maybe that only happened a few times... but still!) There's something about going to get your hair done and counting on the fact that you will like it once the stylist is finished... And if you don't like it, they will fix it, no matter how long it takes or if there is another customer that's already arrived. And if you're not as into the whole obligation thing, you can start a "Bar Tab" where you buy a bunch of never-expiring blowouts at once and they take them off your tab whenever you come in. To find out more about their membership options or to purchase one, click here. Another thing I love about Drybar is how well they've branded themselves. Everything they touch turns to the Drybar gold/yellow and always looks so cute and pretty. From their website, to the design of each of their locations to the hair products they sell and their promotional materials, everything is impeccably designed and gives the feeling of fun, fabulous, beautiful and chic. That may not make any sense, but if you visit one of their locations or even their website, I think you will get what I mean :). 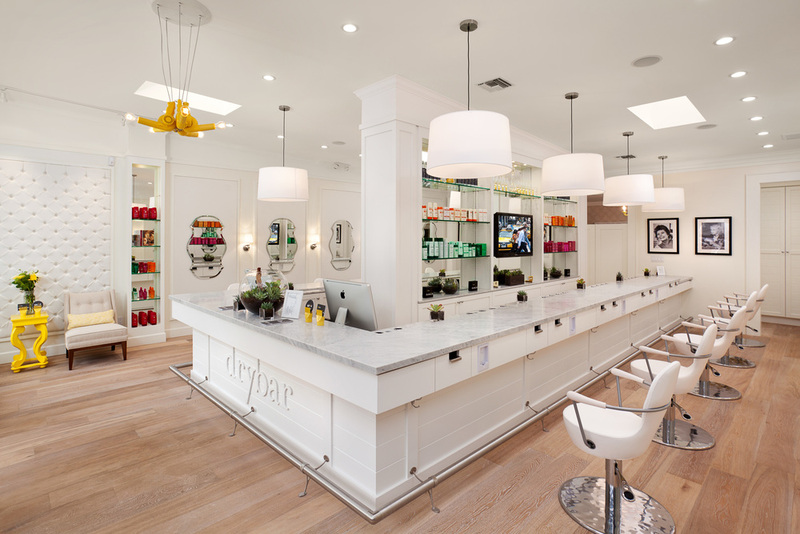 Drybar is not in every city/state yet but they are continuing to expand (click here for locations list). And who knows, maybe you have to come to one of the cities they are in for a wedding, special event, hot date, etc. and you will know you are in good hands. *And just so you know, I received nothing from Drybar in exchange for writing this post... but that doesn't mean I'm not open to still receiving anything from them ;). JK.. Well maybe not.. Ok, just kidding. I'm just a big fan and wanted to share the info with my fans.